Will 100% of aquatic weeds be removed? Approximately 95% of weeds will be cleared. We’ll purposely maintain low lying native weeds chara and eelgrass that grow as long as grass and help prevent other people’s invasive weeds, fragments, and seeds from coming into your area and taking root. Will weeds be removed permanently? While you’ll notice immediate and longer-lasting results than chemical or other mechanical removal treatments will provide, there is no way to permanently remove aquatic plants. Similar to weeds on land, weeds grow back and new species grow up at different times throughout the season. How often will Waterfront Restoration need to visit my property? 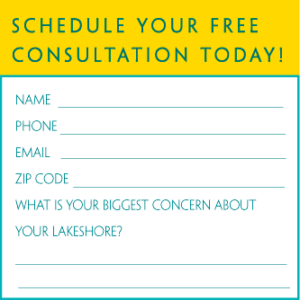 During our consultation, we’ll talk about your particular needs and lakeshore uses. Our different plans range from Monthly to weekly removal and allow you to choose the control you would like. A minimum of 3 visits is highly recommended. This is an annual service that you renew each year. Does the amount of weeds decrease over time? Just like many types of plants, there is new growth every year and it is typically similar to the growth experienced in the previous year. Unfortunately, it is simply something you have to continue maintaining. On most lakes with invasive species (such as Eurasian Milfoil and Curly Leaf Pondweed) you will not notice a decrease in density over time. Invasive weeds fragment easily and frequently repopulate the same area next year. The main factors determined in pricing are: the size of the area, the type and density of the weeds, the sediment type, and the frequency of visits. On average, pricing ranges from $1500- $3,500 for an entire four-month (season-long) control. Is the work insured and guaranteed? YES, there is no other weed removal service that offers more comprehensive liability and damage insurance, and every technician is background checked and 100% certified. We also offer a seven-day Love-Your-Lakeshore Guarantee so if for some reason anything looks amiss, let us know and we’ll fix the problem immediately. Do I need a DNR permit for Waterfront Restoration’s visit? Our year-round office staff is available 9 a.m.-5 p.m. weekdays, and we’re all lake- and people-lovers. If you have questions or concerns, just let us know!